You want the process of integrating technology in your work to be easier. There are many, many resources technology for human service organizations out there focused on marketing, fundraising, donor management, and cause or mission-based use of technology. My niche is a bit different. I’m providing information and tools that focus on the use of technology as a service tool in human resources. I’ve been working with a number of immigrant-serving organizations to help them shift their work online. From frontline to management, the process needs to be inclusive. They’re taking the small strategic steps needed to build a lasting online service system for their clients. I’m also talking with others who have been pioneers in the field to share their promising practices and what they’ve learned. I’m curious about your ideas, questions, frustrations, aspirations about using technology in social services. Check out my podcast, share some research, learn about the Nonprofit Service Canvas! There are thousands of human and community service non profits that want and need to use technology, especially social media, in their service work. In this podcast, I interview people who are doing it. You can learn from them. I have found and am still finding useful research in this area. I’m pulling everything I find together in this section of my blog. Please suggest research and reports you find useful! My first attempt at a product! This is a new tool to help you create a quick proposal for a new service idea. In many nonprofits, front line workers know what they need to provide the service their clients need. “Making the case” isn’t always obvious in their organization. Likewise, managers get new ideas from their staff, but aren’t sure how to evaluate them fully to bring them up the decision-making hierarchy. This is especially true when it comes to technology-related ideas. 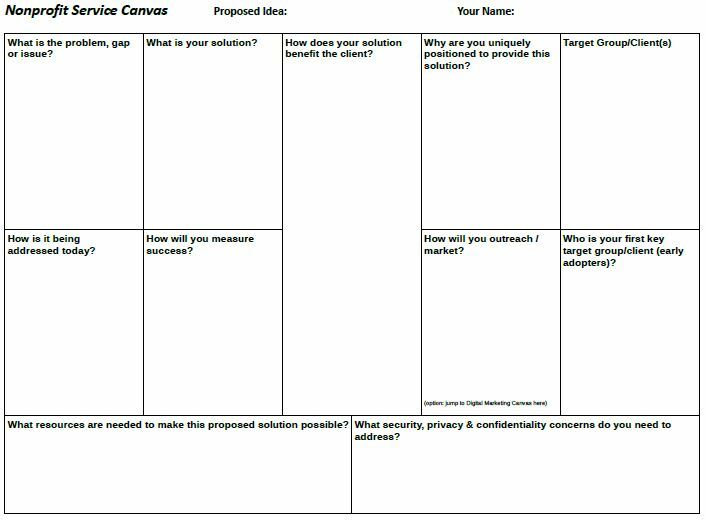 The Nonprofit Service Canvas is a quick and easy, but comprehensive, way to capture your project idea. I’m going to refer to the tool as a canvas because you’ll be creating something new on a blank piece of paper, like an artist with a blank canvas.